I've missed the last few weeks of the SC on SCS...Here's a card I created using today's SC232. I used the Heavenly Holes Technique on the flourish from Stampin' Up! 's Baroque Motif set. 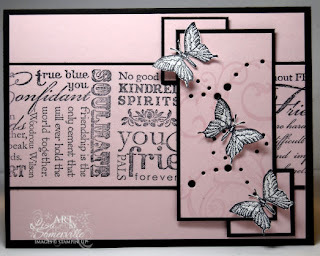 The Butterflies are stamped in Black on white card stock, cut out and adhered with Glue Dots. The sentiment is Stampin' Up! 's Friendly Word Wheel. Wow! this is so delicate and beautiful!